Home Costs > How Much Does a Wrap Around Porch Cost? 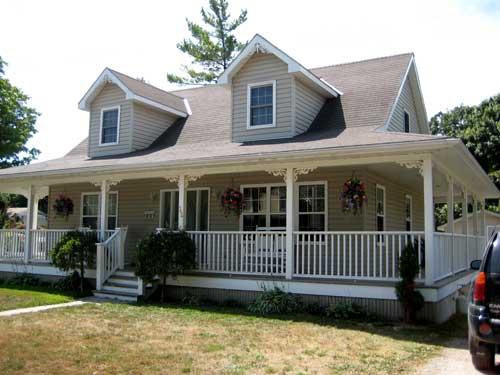 A wrap around porch, unlike a traditional porch, will cover two, three or all sides of a house. They can also be broken down to offer several access points in the home. The cost of a wrap around porch will depend on so many factors, including the size of the porch, the materials being used, the style, the contractor and where you live. Based on these factors, the average cost, when hiring a professional, can cost anywhere from $50 to $80 per square foot; however, these costs could be much more if you were to upgrade the railing, pillars and/or flooring surface. Refer to our factors mentioned below to see how the prices could increase. Since every porch job is going to be unique, it will be impossible to find the exact estimates online. For that reason, we recommend using HomeAdvisor.com to receive estimates in your inbox. Simply describe your job and licensed, reputable contractors in your area will contact you with more information for free. According to Stanton Homes, a wrap around porch can cost at least $5,000 to $15,000 or more when adding it to a new home. With any porch being built, the price will depend on the contractor, the size of the porch, where you live and the type of wood/material that is going to be used. The Washington Post, according to the builders they interviewed, said it’s reasonable to budget $70 per square foot. As with most projects, the larger the porch is, the more you can plan on spending. What kind of surface are you looking to add when the porch is being built? Common options include concrete, wood, tile, brick or slate. The type of railings you’re installing, like the flooring surface, can affect the pricing as well. The pillars, which are responsible for supporting the roof and porch foundation, can affect the costs if you were to upgrade from the typical 4×4 support beams. A Craftsman stone column, for example, could cost five times more than wood. A wrap around porch made from pressure treated wood will cost much less than plastic or composite. Adding a wrap around porch often means you have to extend your home’s roof to match your home’s style. Therefore, the type of roof can increase the costs. Most porches will be built by wood all around, including the flooring; however, if you were to upgrade the flooring material to tile, slate or something similar, then the costs could increase by as much as $4 to $8+ per square foot. A wrap around porch is often open, but some want to screen it in, effectively increasing the costs. Adding electrical outlets can cost around $700 to $1,000 each. The same can be said about hooking up lighting and/or ceiling fans. Most contractors will not paint once the porch has been installed. Staining and painting will be an additional fee to consider if it isn’t included in the initial quote. For those who are unsure of the design they want, an architect may be required to draw up some plans. Depending on the complexity, this could cost $500 to $2,000 or more. A building permit will be required in most areas and will cost a few hundred dollars, depending on where you live. If trees or excessive debris were in the way, additional fees could apply. Corners are the traditional 90 degrees; however, if you were to want them rounded, this could increase the costs by 10 percent or more. With a project of this size, it’s always best to get at least three to five quotes from licensed contractors in your area. Most will be more than willing to come to your home to discuss your needs for free.